It really made me laugh last week, when I received three FB updates within seconds of each other spreading the glad tidings that P. Diddy had quoted L. Tom Perry on Twitter. I just had to laugh. I mean, wow, the world pays members of The Church of Jesus Christ of Latter-day Saints a little attention and we get all psyched. But then this afternoon, I opened up (on my phone) to this week's Young Women Lesson that I have been assigned to teach called "The Ability to Succeed," and the first quote was none other than the L. Tom Perry one that P. Diddy quoted,"One of the greatest weaknesses in most of us is our lack of faith in ourselves." I've been around fame before, and like most of you, I understand how fads and popularity work. As they say on Project Runway, "One day you're in, the next you're out." 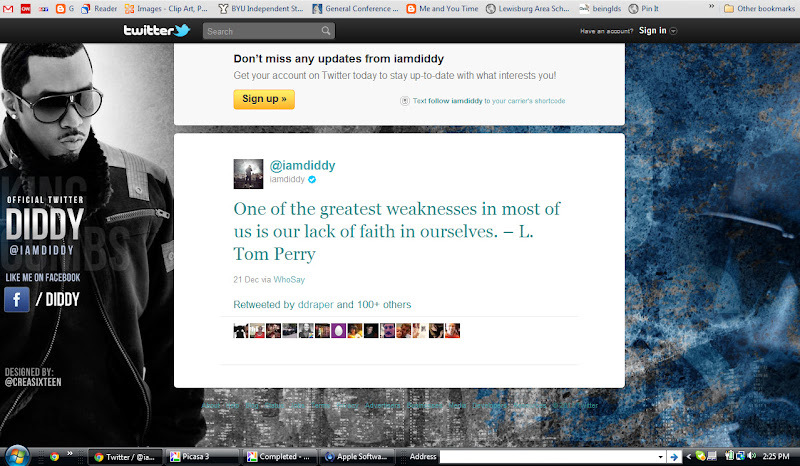 So, just for the record: I was Mormon, when being Mormon wasn't cool enough to be quoted by P. Diddy. Before President Monson was named one of the Top Ten Most Admired Men in the World. And before Mormonism was named "Religion of the Year for 2011" by Time Magazine. And when its not "cool" (in the politically correct sense), once again, to be a Mormon, I still will be. And that, my friends, is "how to succeed." PS - Diddy, you asked today on Twitter what I was doing for New Year's Eve, well, I'm going to Jacquie Daniel's house along with the Youth of our ward, and we are going to party like it's 1999, or 1959 depending on which crowd you were running around with in 1999. No really, we are. We're gonna drink some 7up, eat some pigs in a blanket, and watch some G or PG-rated movies! Awesome, I know! That's awesome! I am completely out of the loop! Never heard any of it! Thanks for the post! Wow! That's awesome! Thanks for sharing all of these media tidbits... 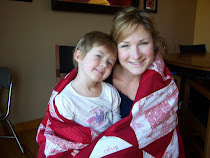 I'm fairly new to your blog, but love it. Happy New Year! we are going to begetting lots of quotes since mormons are now on the forfront. In a way it does put the name of CHRIST in everyone's faces whether they like it or not. I think its awesome. so funny! SNL had a recent (albeit a bit sacrilege) sketch and at the end "Jesus" said...oh..and "Mormonism..it's all true..every word of it." You're hysterical. I love it! Awesome, great to hear some good news! You totally made me laugh. I'll be there with you.